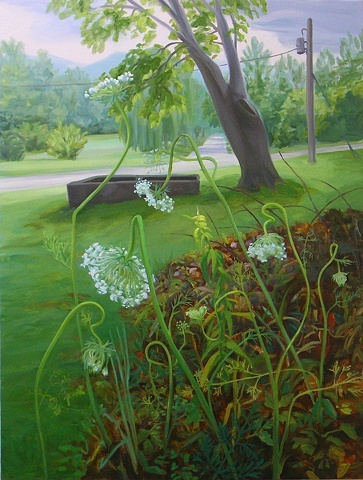 Also known as wild carrot, Queen Anne's Lace was brought here from Europe by colonists for medicinal purposes.Widespread in North America, it is frequently found on old farmsteads, as well as disturbed dry prairies, abandoned fields, waste places, and roadsides. Unlike some other non-native prairie plants, it is not deterred by burning and is controlled with herbicides. The specimens in this painting show the effects of such an herbicide.